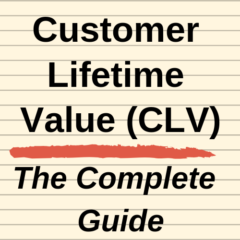 In the customer lifetime value calculation, average customer acquisition costs are deducted from the customer’s profit contribution over time to determine the customer’s “net” profit contribution for the entire period of the customer relationship. As well, the acquisition cost as compared to the total customer lifetime value enables the calculation of a marketing ROI. Customer acquisition costs are all the expenses incurred by the company (or brand) in order to generate (and fulfill) a purchase from a non-customer. The purchase is coming from a non-customer to the firm – which may include former customers (see the article discussing non-customers and lapsed customers). As with the standard CLV formula, we are calculating acquisition costs on a per customer basis. This may be calculated on an individual customer, or a particular customer segment, or for the total customer database. For another example, let’s now consider the following firm that attracted 1,000 new customers in the last year. In the same time period, they were able to isolate the various costs that were used to target first-time customers, as listed below. Acquisition Costs (AC) = $5m / 1,000 = $5,000 (average per new customer). What should be included as an acquisition cost in CLV?